Juan Garrido-Salgado, The Two Rivers of Granada Descend from the Snow to the Wheat. I’m not a poet, nor a commercial publisher. Therefore, there are things I can’t do, even if I research them: I can’t really talk about perceptions of stigma from within the poetry community, or spout statistics on how many self-published poets find their way to ‘real’ publishing. I can’t tell you whether the poems that I have in front of me are ‘good’ or ‘bad’ writing, although I know if something is awful – and none of them are that. I am a mix of designer, printer and artist, and I have spent most of my creative life in the company of poetry books, but on a different spectrum: zines, artist’s books and fine press books. All of which are, let’s face it, self-publishing formats. So what I propose to do is examine these four books through that lens, do some ‘thick description’, and see what emerges. First, though, I’d like to show you why self-publishing is particularly easy now, from a material/technological point of view. Independent publishing has always been possible throughout history, but until the last twenty years or so, it has depended upon commercial relationships with those who own the means of production. The means of production were large machines, expensive to run and demanding to maintain, especially in terms of space and energy; machines that were physically dangerous, laborious to use, dust-catching, heavy and hard to move, and increasingly technical. The machines are still there – someone has to print on demand – but we don’t easily see them because that involves international travel to Asia. Private presses (those not beholden to commercial demands) were usually owned by those who had enough money to obtain and house some of the prettier pieces of equipment and the leisure to use it. Innovative poets and artists needed to befriend a printer, commercial or otherwise, and persuade them to use their skills interestingly (this is still often the case). The first big change that gave poets and artists the power to fully realise their ideas was not part of the ‘press’ side of production, but in the ‘pre-press’ process, thanks to photography. The development of photographic reproduction in the very early part of the twentieth century allowed people enormous liberty with page space. Initially it was expensive, as text would still have to be set and printed with letterpress and then cut and pasted into interesting shapes before photographing and printing (this is one of the reasons why collage, using found text, was so exciting for the Dadaists et al). A few decades later, however, printing technology had advanced to the point where anyone could prepare text (‘artwork’) for the press using hand-drawn graphic methods, cut-and-paste text from typewriters and dry transfer lettering like Letraset, and it could be printed reasonably affordably (See Burke 1980). That is, if you could afford the offset printing process, which required a minimum of 500 copies and got exponentially cheaper the more copies you printed (which is why everyone had boxes and boxes of unsold books to store under beds and in broom cupboards). Later, ‘camera-ready copy’ was available to anyone with a personal computer and graphic software, and desktop publishing (in theory) allowed self-publishing to look much more professional. Alongside this commercial publishing activity was the alternative stream of publishing, the kind that wanted or needed to sidestep the large machines. William Blake is one of the most famous self-publishers of history: he wanted to ‘cut his production costs, to be free of publishers and printers’, so he engraved his poems – backwards – onto his etching plates, incorporating them with his images and printing the plates as book pages (Oppen & Lyssiotis, 13). Not only is he a self-published poet, but he has been claimed as one of the first artists’ book makers, and here we first encounter a slippage between poetry publishing and artists’ books. The next one, after Blake, is Mallarmé, who knew enough about the printing processes of his time (1890s) to know how far he could push the process, which indicates that he had at least a working relationship with a printer. Cheap and accessible methods of textual reproduction have proliferated over the last century: typewriters (especially with carbon paper), screen-printing, solvent copiers like Gestetner machines, photocopiers, risographs, and then desktop laser-printers and inkjet printers. Many of these are being revived by twenty-somethings keen to make something material without wanting to invest in large machines, or if they have committed to the big equipment (like Big Fag Press, in Sydney), they work co-operatively. Bindings, another expensive and technical consideration, were often rudimentary: staples, string, clips, coils. The invention of the desktop computer and printer, and then a blip further, the development of the internet, is the biggest publishing revolution since the invention of the printing press. Suddenly there was infinite space, and very few overheads. Send a file by email and print one book at a time, via digital publishing or print on demand. But — why ‘print’, when you can simply jump to ‘publish’? Websites: blogs, online journals, digital archives, all threatening to kill the material book. Yet the book has refused to lay down and die, and poets as well as creative publishers like me are part of the reason why. It has never been easier to self-publish across every genre of visual/textual expression than right now. Design, production, marketing, commerce: everything has dedicated software and most parts of the world can easily access your work if they know how to find it. So why does the notion of self-publishing make people wince? Self-publishing, as I mentioned earlier, is an accepted form of artistic publishing. This is thanks to the persistence of the attitude that unique or limited output is of greater value than something produced in multiple – propagated, says Pierre Bourdieu, by the ‘cultural bankers’ (77). The opposite seems to be valued by poets: the dream is a wide audience, lots of good, serious reviews and ultimately – perhaps for one more generation – a large hard-copy print-run by a reputable publisher. Even when the poetry is conceptual, immaterial, gleaned from trawling the internet, it still often manages to end up as a hard copy book, because that matters. For one more generation, perhaps? Let’s look at the first of my four examples: a downloadable PDF by Romy Durrant called Love Poems. Durrant, from her web presence, is a young savvy feminist student whose online username is @miseryclit. Her prolific output includes visual art as well as writing, and she is one of the founder/editors of a new online publishing platform called Alien She Zine (‘for women and non-binary artists and writers (but not exclusively).’ Calling the resolutely immaterial site a ‘zine’ is almost a manifesto, since zines have been the most lo-fi, low-tech, material vehicle for self-publishing since at least the 1950s. Love Poems is downloadable for free from scribd.com and is a simple PDF file. Judging from Durrant’s other work, I supposed the title to be supremely cynical. It is cynical, but not supremely, because it turned out to be a tale of being lost and then found, or of seeing too much to be innocent, but still hoping for happy endings. The darkly saccharine photo-collage images reinforce the words like light bulbs switching on, then off as the file moves down. This entry was posted in ESSAYS and tagged Caren Florance, Cathoel Jorss, Juan Garrido-Salgado, Justin Lowe, Romy Durrant. Bookmark the permalink. Caren Florance often works under the imprint Ampersand Duck. She is an artist/designer who focuses on the book and the printed word and uses traditional and contemporary processes to play with material poetics and poets. 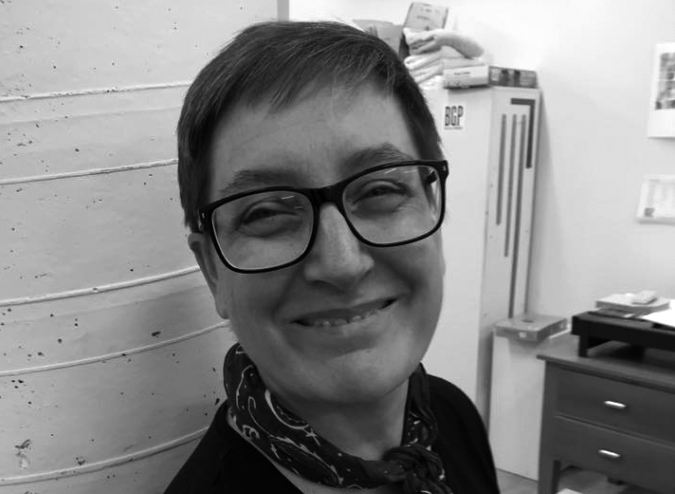 Florance is currently a PhD student in the Arts & Design Faculty of the University of Canberra and a member of the UC Centre for Creative and Cultural Research. Miguel de Unamuno Question to Us: Why that Lilies the Ice Killed?